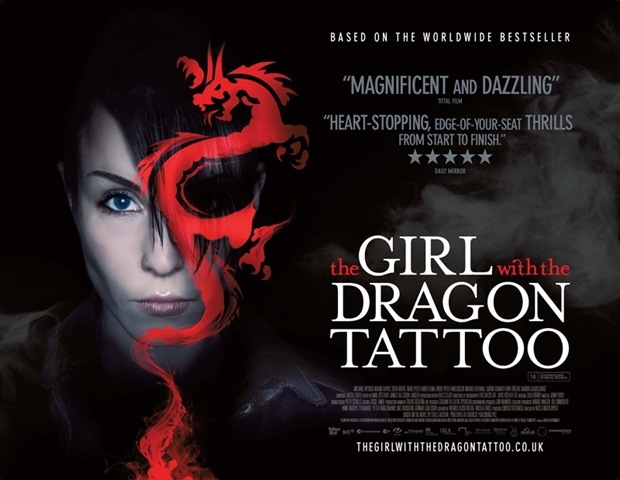 MOVIE REVIEW: The Girl with the Dragon Tattoo – Multi-Layered Thriller Sneaks Up on You! The Girl with the Dragon Tattoo is a two-and-a-half-hour movie that feels much shorter. The multi-layered thriller is based on the Stieg Larsson best seller Män som hatar kvinnor [Men Who Hate Women], itself a richly complex work that runs over eight hundred pages [none of it unnecessary]. The plot revolves around a disgraced financial journalist, Mikael Blomkvist [Michael Nyqvist] found guilty of libel; Lisbeth Salander [Noomi Rapace], a researcher with a photographic memory and amazing computer skills – but equally few social skills; a fourteen-year old girl named Harriet, who disappeared forty years ago; her uncle, who never gave up trying to find her killer; a family composed of mostly disagreeable and even reprehensible members, and what happens when Blomkvist is hired to find out who killed Harriet.